Well, I finally tried it. Two weeks ago, I was all set to be good and eat healthy for the week in between a trip to Phoenix and a house boat trip (story to come) when two friends from work suggest (FORCE!) we go to Taco Bell for lunch. Upon arriving at Taco Bell, I was assaulted by signs for the Bacon Cheesy Potato Burrito. Not only were there signs, but my two friends nearly demanded that I get the Bacon Cheesy Potato Burrito. So, I did what I had to do and got it. While I am a firm (giggity) believer that bacon makes everything better, there was not enough bacon in the bacon cheesy potato burrito. It was good, but had potential to be so much more. Now, if you're not "that" into bacon (a.k.a. a communist) then you probably won't dig this burrito. If however you think that a breakfast that comes with bacon could be improved by having more bacon, then run, don't walk, to your nearest taco bell. UPDATE: It's been brought to my attention that there's a bit of a contradiction here. I said that there isn't enough bacon but that if you don't like bacon you shouldn't try this. This is not a contradiction but a further emphasis on my love of bacon and more of it. Thank you. I hate to inform you, but i tried to get one last friday and they said they no longer carry it. At least there is still Big Zack's Breakfast to hold high a standard of bacony delights. That is indeed sad news. 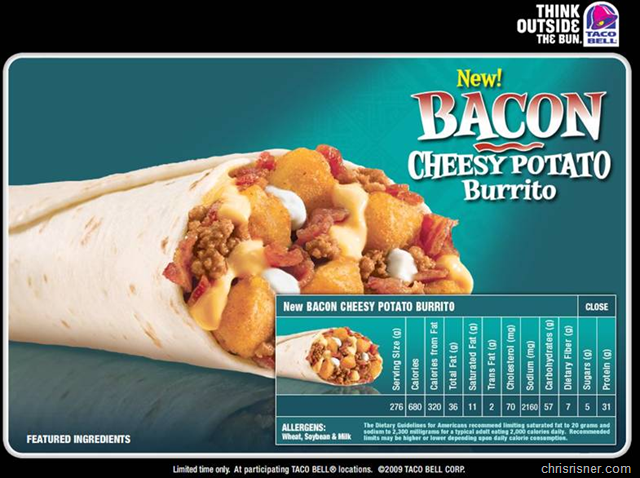 We can only hope that it is because they're researching how to make a bigger and better Bacon Cheesy Potato Burrito!